If, for any reason, you get tired of swimming in our beachfront pool or lounging on our sugary white sands, there’s a place just down the road where you can shop until you drop … right back into a beach chair. There are more than 125 retail stores boasting apparel, home goods, jewelry, toys, books and more — all at 30 to 70% below retail prices, because you’re purchasing directly from the manufacturer. This is a great spot to spend a rainy day, because you can traverse the entire complex without getting wet. Walkways are covered throughout, and the place is so huge it has its own transit system. Here’s a random sampling of some of our favorite stores: J. Crew Factory, Kate Spade New York, Seiko, Nike Factory Store, The Children’s Place, Eddie Bauer Outlet, Carter’s, Yankee Candle, Samsonite, Le Creuset and more. To see if the outlet mall features your favorite retailer, view a full list on the Store Directory, and map out your shopping spree. Regular center hours are 9 a.m. to 9 p.m. Monday to Saturday, and 10 a.m. to 7 p.m. Sunday. Holiday hours are available here. At the customer service booth in the Food Court, you can request a current coupon book for additional savings. You can also get a quick bite to fuel up. Check out the Center Events page to learn about discounts that may occur during your stay, from AAA to AARP to military savings. When the kids get tired of following Mom from store to store, there’s a playground complete with a carousel and splash pad. 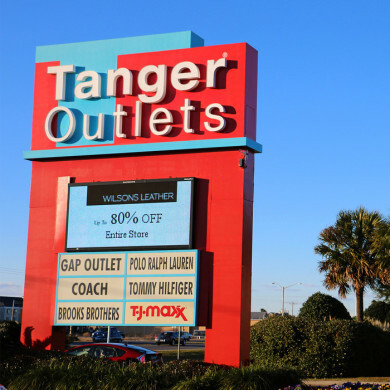 Tanger Outlets is located at 2601 S. McKenzie Street in Foley, AL. For more information, visit the Tanger Outlets website or call (251) 943-9303.